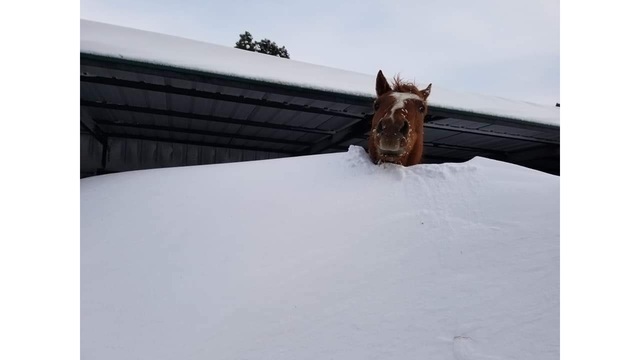 A horse looks out from shelter over a snow drift March 14, 2019 in Kiowa, Colorado. An historic blizzard exploded over eastern Colorado Wednesday, leaving record-breaking wind gusts and stranded motorists in its wake. 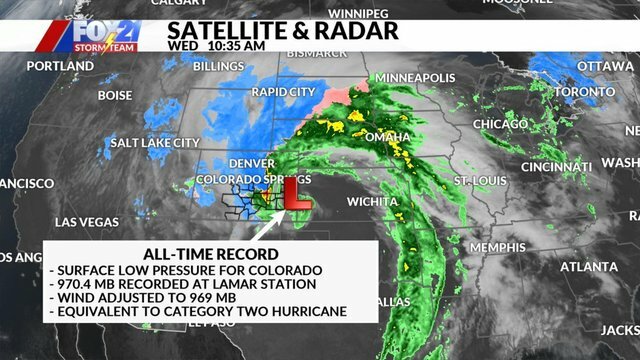 The lowest air pressure ever recorded in Colorado occurred in Lamar on the far eastern plains in the late morning as the storm peaked in intensity. The storm underwent bombogenesis in southeast Colorado as it emerged from the Rocky Mountains. When the surface station in Lamar measured its lowest air pressure of the event, there was some light wind. "Wind implies a pressure gradient," said David Roth, senior forecaster at NOAA's Weather Prediction Center. "Based on the observation, a conservative rule of thumb of 1 millibar adjustment per 12mph can be applied and a 969mb central pressure estimate can be obtained." Surface pressure indicates storm strength, likely wind strength and propensity of a storm to produce heavy precipitation. The 969mb central pressure is equivalent to a category two hurricane. The storm developed rapidly, "bombing out" in the southeast corner of the state. Bombogenesis, while it sounds like a hyped up weather headline, is actually a technical term. A storm that drops more than 24mb in pressure over 24 hours is classified as undergoing bombogenesis. As the strong storm lifted northeast and the rain and snow level dropped below 6,000 feet, a blizzard developed from Colorado Springs northeast into Kansas, Nebraska and the Dakotas. 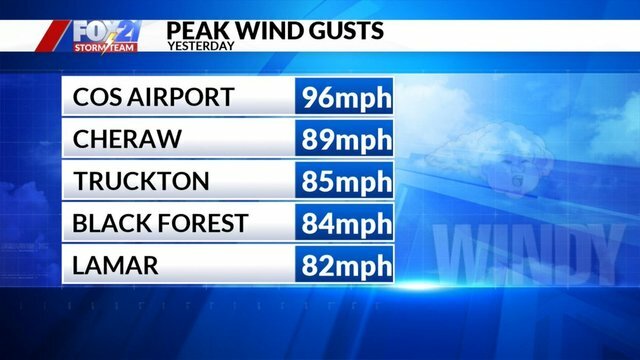 An all-time record high wind gust of 96mph was recorded at the Colorado Springs Airport during the early afternoon. Many areas on the plains reported wind gusts between 70 and 90 mph. Peak wind gusts in eastern Colorado Wednesday, March 14, 2019. 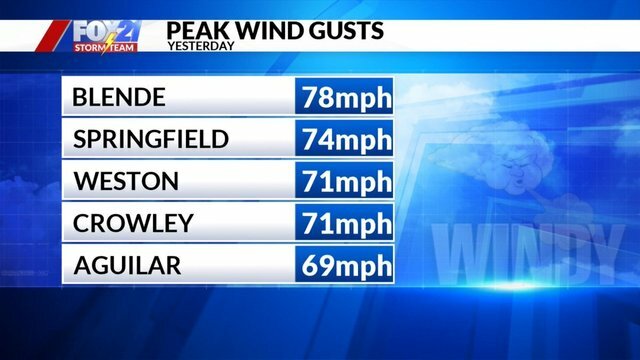 Peak wind gusts measured in eastern Colorado Wednesday, March 14, 2019. 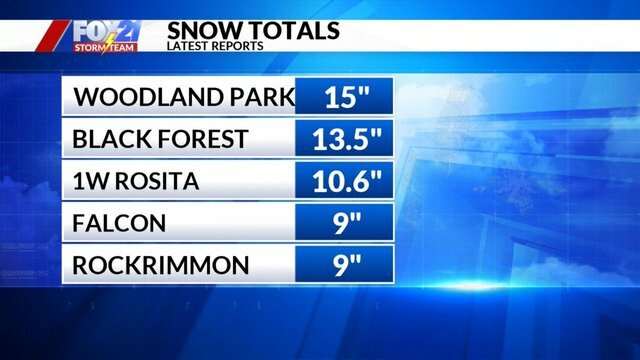 Snow amounts ranged as expected, from more than a foot in some parts of the Pikes Peak Region to nearly 10 inches across the north side of the Colorado Springs metro area. Residents reported numerous drifts of 3 to 6 feet, with many cars abandoned on area roads during the height of the storm. Snow amounts measured in the Pikes Peak Region March 14-15, 2019. While southern Colorado Springs received 1" to 3" of snow, most areas south of the city toward Pueblo and across the eastern plains along the Arkansas River only saw rain. Even here, the moisture was beneficial and Pueblo set a new record rainfall for March 13 at 0.87". Areas that did experience the colder portion of the storm received a very wet and thick water-laden snow. This produced sheets of ice on streets and bridges and stuck to homes, trees and livestock. 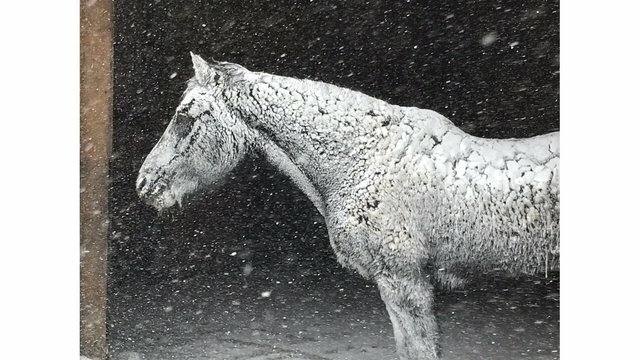 A horse is covered with wet spring snow during a heavy snow in Florissant, Colo. March 13, 2019. "Onyx is guarding the barn," said Tom Lowmann, the owner of the horse. 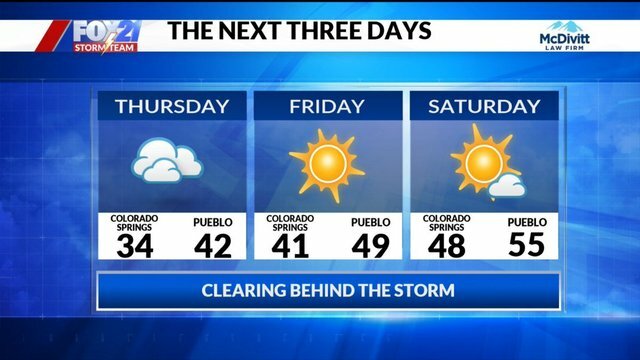 Rapid snowmelt will begin on Friday as the sun comes out in earnest and the temperatures get above freezing. Area roads should see a drastic improvement in the sheets of ice on Friday, but the snow drifts will continue to melt over the weekend with highs in the 50s and sunshine continuing. Three day forecast for the start of the weekend.